Though uncommon for India, wooden construction is slowly becoming a high-end trend among Indian ecology lovers. Russian wood has all chances to capture the emerging market. One would easily imagine a cozy log house in the middle of snowy Siberian forest throwing wreaths of smoke from an oven. It’s far more difficult to imagine such a house in the middle of a sun dried valley somewhere in Maharashtra or Gujarat. “Why not,” thought an Indian businessman who is now supplying Russian wooden houses to India. “The specific of a wooden house is that it will keep you warm all winter long and cool during hot summer. It really suits Indian climate”, says Prabhat Ranjan Dubey, Director at Maharaja Environment Technologies Pvt Ltd based in Navi Mumbai. His company imports Russian log houses from Siberia. An alumnus of a Russian university, Dubey had earlier tried his hand at a few businesses connected to Russia, but wooden houses seem to have the best potential. Two years ago, Maharaja Environment Technologies partnered with JSC “KLM Co”, one of the largest timber companies in the central Siberian region of Krasnoyarsk, known for its rich forests. KLM having large logging and timber processing units and distributional companies sells its products both domestically and in Europe, China, Japan, Egypt, Turkey. India is the latest international market. Wooden houses manufactured by KLM are now offered in India by Maharaja Environment Technologies. Ready-to-assemble logs are imported from Russia and then assembled at the spot by Maharaja’s local workforce that has received special training in Russia. Mumbai-based Irina Kirillova, a Russian-speaking Business Development Manager at Maharaja Environment Technologies, says a standard log house can be assembled by 5 to 10 people within a month. However, it takes time to order and bring the wood from Russia and clear customs, thus making it almost 5 months from the moment of the order till the finished house can be handed over to the customer. Maharaja Environment Technologies positions its wooden houses as a second home or a weekend residence most probably outside the city. The cost of wooden log house in India today amounts at Rs 3000 or $55.6 per square foot, double of the cement construction cost. However, Manish Wakde of Katyayani Infracon believes the higher cost is not the issue. “Comparing to the concrete construction where one has to pay for finishing first and further for maintenance, wooden house becomes even a cheaper option ten years down the line”, he says. He estimates the cost of concrete building along with finishing as about Rs 3650 ($68) per square foot, while wooden houses will cost somewhere around Rs 4000-4500 ($74.3 - 83.6) per square foot. China is becoming one of the largest markets for KLM Co which opened an office there. Bor says in contrast to India, Chinese customers prefer glued-beam houses rather than traditional log houses. China itself supplies wooden construction technology to India, though Prabhat Dubey insists that a Chinese house is not competition for a Russian log house, but rather a different niche. Currently Maharaja Environment Technologies has show houses in Panvel, the outskirts of Navi Mumbai, and Lonavla , about 100 kilometres from greater Mumbai. Here Maharaja’s customers can feel what a Russian log house is in a real Indian environment. Lonavla surrounded by hills is one of the debut destinations for the company. Maharaja supplies its log houses for “Upawan” project developed by Katyayani Infracon Pvt. Ltd. near Pavna Lake in Lonavla. “The project includes the resort and some farm houses which we are constructing and selling to end-customers. 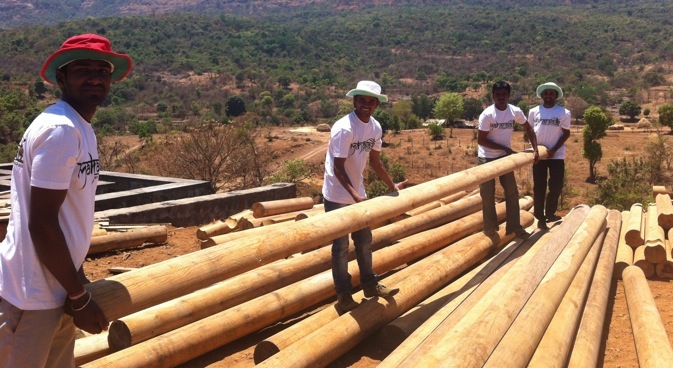 We decided to promote wooden log houses as the main idea of our project is that the environment should not be disturbed,” says Manish Wakde of Katyayani Infracon Pvt. Ltd. The developer hopes to reach projected sales target of 50-60 houses per year in 2013 targeting customers ready to pay Rs. 1.5 -2 Crore ( $270,000 -$370,000) for a log house. Manish Wakde had been searching for wooden houses vendors for quite a long time before he found the importer of Russian wooden houses. “There is some company from Slovenia, though they do not promote log houses, there are many US companies which offer such houses but do not bring it here, we have to import it from US. There are Chinese companies in the market, too, but we don’t consider Chinese pine as good as Russian pine. When we luckily got Maharaja with Russian log houses into the picture getting the houses became easy: we are simply buying the ready-made house from them”, Wakde says. Gujarat with its Kandla sea port being the largest timber stock yard in the country is another promising destination for Russian log houses. Maharaja Environment Technologies partnered with India Green Reality Pvt Ltd based in Ahmedabad. The company develops two projects in Gujarat and Kolkata under the name of Greenland Eco Village. “In Gujarat we are planning to build about 300 houses. Out of this 12 are fully furnished wooden cottages of about 550 square feet. In Kolkata we have a huge area for development of residential complex, about 300 acres. There we also planning to build log cottages”, says Vinod Thakur, Director at Green Reality Pvt Ltd. He had visited factories in Siberia and experienced living in wooden house before he realised the concept would work in India too. “Initially we planned that we will order only houses but after visiting Russia we decided to go for wooden furniture as well. In a Russian house everything should be Russian,” Thakur jokes. Maharaja is also eyeing North and North East India where wooden constructions are traditionally more common. In Shillong the company is planning to supply about ten wooden houses. Shimla is a promising destination, too, though the competition is already active there: “The Chalets Naldehra,” a log cottages resort near Shimla, is built of Scandinavian log houses. “Goa is another prospective region for us as there are many areas where cement construction is not allowed, mostly near the sea shore. That’s an ideal place for wooden resorts and we see big potential in this niche. Today we have about 500 clients all over India, however this is just the initial stage of market penetration,” Irina Kirillova says.